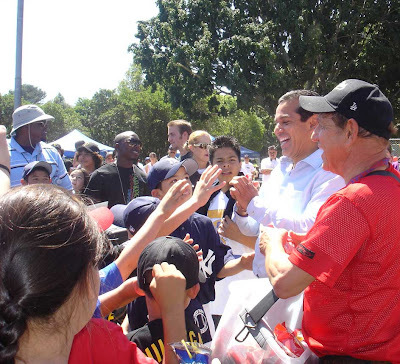 Los Angeles Mayor Antonio Villaraigosa and a longtime Dodger Stadium peanut vendor joined young ballplayers and their parents to celebrate refurbished fields at Peck Park. 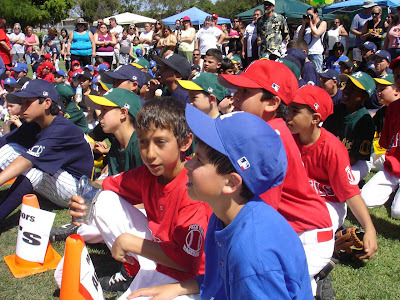 The San Pedro Youth Sports Association organized the April 12 ceremony, which drew hundreds of Little League players from San Pedro teams. The group originated in the 1980s and was recently re-activated. Its purpose is to advocate for improvements to public ballfields and to raise funds to sponsor players, said president John Delgado. The association is collaborating with the Department of Recreation and Parks and the park advisory boards. 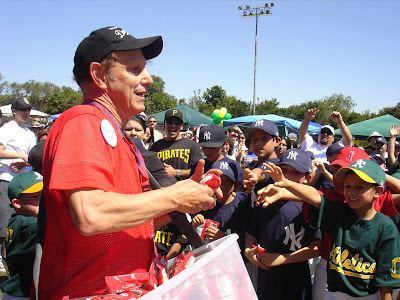 Mayor Villaraigosa addressed the cheering crowd, signed autographs, posed for pictures and threw peanuts alongside longtime Dodgers peanut man Morton Rose. 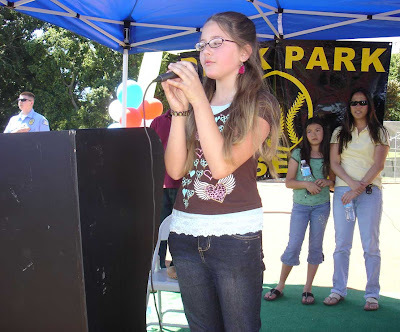 Thea Yodice, 10, sang the national anthem. Mayor Villaraigosa and peanut man Morton Rose delivered the goods. 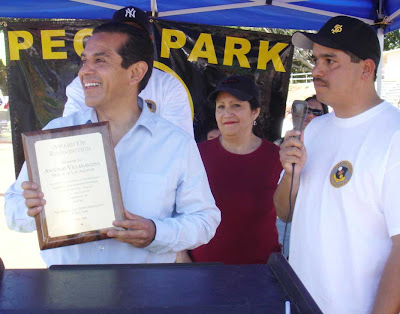 Villaraigosa received a certificate from president John Delgado. Dolores Canizales, center, represented Councilwoman Janice Hahn. 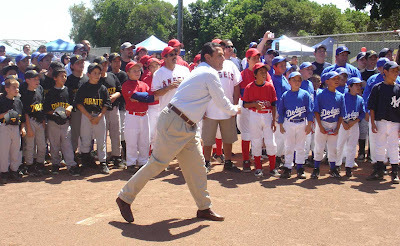 All eyes on First Pitcher Villaraigosa. San Pedro News, Washington Edition covered former Rep. Janice Hahn (D-San Pedro) and federal issues from 2011 to 2013. Archived posts from 2008 to 2010 cover San Pedro, Calif., community news. This news blog was published by Andrea Adleman, a professional journalist and former columnist for the late More San Pedro newspaper.